Learning to paint is not the daunting task you might imagine. For nearly fifteen years I told myself, daily, that someday I would take art lessons and learn to paint. I would walk by paintings in the museum and think to myself, "If I just had someone to teach me, I could be the next Great Master." But, for all the longing and wanting, I never did anything about it. I never signed up for classes, and I never picked up a pencil or brush. About three years ago, I began studying art history, and through that study I began to learn about art concepts such as; dimension, perspective, and foreshortening. I began to have an understanding what it meant when someone referred to drapery on a subject, or the movement of a work. It was then that I decided I could paint. It wasn't as hard as I thought, and the only thing that held me back at all was me. Once I learned that I could tell myself that I could do something, the art started pouring from my fingers and leaping onto the canvas. To begin painting it is important to have the right tools. I recently found an artist's canvas pad, at Wal-Mart, which is perfect for practicing the art form. It is similar to a sketch pad and only costs around $5.00. This pad is perfect for beginning artists. Before you purchase brushes, it is important to decide which medium you are going to use. I have painted both in acrylics, and oils. There are at least two major differences in the paints that will help you decide which option is best for you. Acrylic paints are much cheaper than oil paints. They can be purchased in tubes, or even in bottles in the craft section of the store. I have used some acrylic from the craft bottles, but generally I use the tubes. 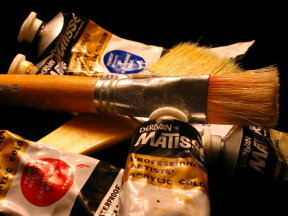 Oil paints, however are generally sold in small tubes, and can be very pricey. Another thing acrylic painting offers is that the paint dries much faster than oils. If you are the type of painter that wants to produce a work in a fast manner, I call it sit-down-and-get-through, acrylics would be best. But, if you enjoy taking your time with the paint, oils may be the better option. When acrylic paint is used on a brush, it is easy to use a little dish soap, a trick an art teacher once told me, and wash it off. When using oils, paint needs to be removed with a thinner, not soap and water. 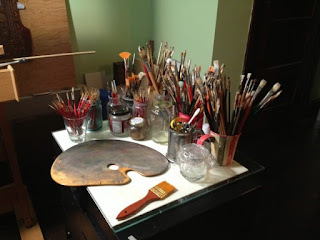 Because acrylic brushes can be cleaned with a little soap and water, there is no added expense of the thinner, or paint remover when using this medium. 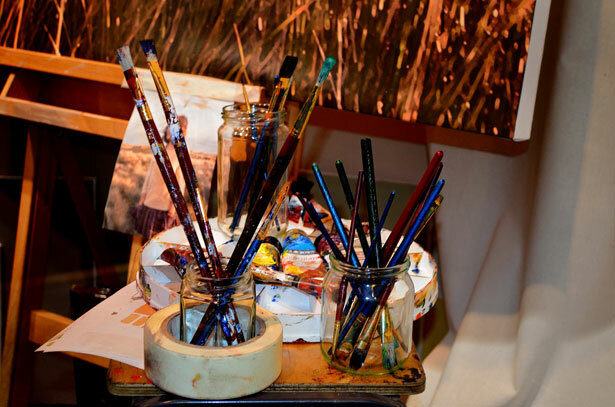 Once you decide which medium, oils or acrylic, is best for you. It is then time to look at purchasing brushes. Buying brushes can be a daunting task, but don't be deceived by all the brand name brushes. 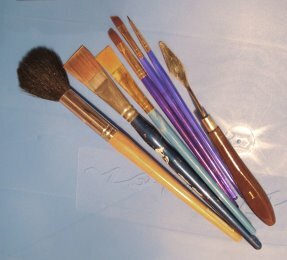 When learning it is best to buy cheaper brushes, and move up to the more expensive brushes. I use acrylic brushes that are made from synthetic materials. For oils, I generally use sable, or hogs hair brushes. If you can't tell which brush is which, while learning, just get a package of brushes from the craft store. But, do not use the plastic bristle brushes that usually come with children's watercolor sets! Before sitting at your canvas, there are some necessary supplies to gather. You will need something to use for a palette, a paper or plastic plate, or piece of picture glass can be used. When I'm not painting at my easel, I also find some old news print to put under my canvas just incase I have an accident. Accidents are pretty frequent when learning to paint, so make sure you have on old clothes. You will also need a container; I use an old jar - painting is great for recycling mayonnaise jars. If using acrylic paints as your medium, fill the jar about half-way full with water. For oils, fill the jar only about a third way with paint remover, or thinner. The thinner can be used for a while, so it is good to have a container with a lid. The water can be dumped after each use. When learning to paint, it is good not to try to go "free" and paint from your imagination. That can be very discouraging! I try to find simple pictures on the internet. Google Images is a great way to find subjects, the more simple the better. Many people will draw the subject onto the canvas, using little detail. But, when I first started painting, I just started by separating my canvas into halves and painting the background and foreground of the piece. Now, I generally draw my subject before I paint. Either way is fine. Remember when painting to always start by painting the objects furthest from you, or deeper into the painting. Work your way to the foreground. I generally like to paint the entire picture and then add more detail as I finish with the work. Also remember, when painting a nature scene, things in the distance may have a blue tint to them due to the atmosphere and distance. While I am still new to painting, I have found with practice that the quality of my pieces have grown immensely. If you want to give painting a try just follow these simple steps, and soon you'll be painting like an old pro. Ultimately the best advice I can give is to love what you're doing and tell yourself you can do it! Do you have a painter hidden inside you?